You thought I was going to ask if there were going to be any didn't you? Just couldn't remember if anyone had posted this yet, and I notice that if they have it wasn't in the Kenshin forum, but R1 box sets for Kenshin have been announced (I think 3 boxes for the three arcs, starting release nearer the end of this year from memory). That'll open up the way for Madman to do the same eventually (though obviously it will be a long while yet because they'll only just be finishing the normal release this year). Sweet. I've already got the Tokyo and Kyoto Arc so I'll just have to wait for Madman to get the Post Kyoto Arc box out so I can buy it. While I still don't like the majority of the post Kyoto Arc it has its moments and I am one of those people who can't stand having an incomplete series. 16 was alright, I thought it seemed a little.... rushed(?) in places. 15 was utter dog **** , I will probebly never watch it again, worst volume EVER. I could keep watching if it was at the standard of volume 16 (volume 17 is at my friends place, I sent it to him because the release date was the day I moved >_< ). And Meguel Sanchez, I believe the 'Holy War' thingy ends at the end of 18. So theres only four more volumes after that, and I believe most of the end has something to do with Germans. Im looking forward to these boxes - Im buying the Kyoto arc seperately, but i'll buy the Tokyo and Meiji Arcs in the boxes. It goes RAPIDLY downhill after that segment finishes. Not Germans. It has something to do with some wierd Ninja`s and some kind of Pentagram that they`re trying to create. It`s by far the worst bit of the entire series. But if this is indeed a Wooden box will Madman be able to just distribute Media Blasters box or will they make their own? I can't wait to see some pictures of the entire box. I'm not too crazy about the design of the box. So if Madman does a better job on the design I'll get that. Wood or otherwise I'd buy which ever one looks better. Hmm at $25 US it is quite steep, I'll have to sleep on it. I know Madman will release there own down the track but it certainly won't be wood. Besides, if I get the first box I've commited myself to buying the other two as well, and $40 or so AU for a box is quite expensive, especially for 3. Personally I prefer the design of Nick's Rurouni Kenshin Boxes, theyd be my first choice, especially as theyre made from metal, as opposed to mere wood. With those Nick's boxes, they look quite good. The Tokyo and Kyoto boxes would suit the series nicely (Kyoto especially), though Im not sure if the Meiji box really reflects the arc well. I mean, it looks good, but doesnt really match up with the content that well, well Im comparing it to the rather fab Kyoto box anyway. But for a fact most of kenshin is based on history of that era yet only fictional it sticks to facts and for the last eprisode it's more a metaphore of what is really kenshin's ideals and purpose is. Man do i sound philosofical or what!!!! Is it a hard wood box? If so then I want! I want! I must say, thats a better looking pic than the other one. Aarr, that hardwood box be treasure fit for the plunderin' says I! Will we all have trouble importing this mofo if its wood? as you there always seems to be problems with bringing wood to the country. I must admit to causing a bit of confusion here. If you mean "Hardwood" like Oak or Jarrah, then I wouldnt know. If you mean "hard wood" as in not soft like paper, and made of wood, then I would say it was. Most Japanese Christians were killed during various purges in the Tokugawa period (I'll have to dig up a source on this). The Tokugawa period was a period of absolute isolation from the outside world, and the government considered Christianity to be a dangerous foreign influence, so they took measures to dispose of it. Audio defects? Where? I mean, occasionally (very occasionally) I might notice something is out of sync with the lip movement, and wasn't there that burst of digital noise on one of the OVAs (or was that a different anime, bah, I forget)? But as far as the television series is concerned, none I have need replacing. Although one day Madman should actually sit down and test their stuff so there's not re-doings of everything all the time, heh. Makes you wonder, doesn't it? I remember I bought 6 Kenshin DVD's at once and the guy at the counter looked pretty surprised. I can't imagine what the reaction would be like if you bought...*counts on fingers*...24 DVD's at once. the guy at the door who checks ppl's bags goes "whoa u got alotta movies there" and in my head i was like "its called anime mate and i'm crazy about them"
If I were the security guard, I would have done the proper thing - rolled you for your DVD's and left you in the dust. Lets please not turn this in to a "i like seisouhen vs i hate seisouhen" debate. We have already had enough of them. Back on topic, I think the perfect box layout would be one for each of the arcs, then another one for both OAVs and the movie. there's a boxset of RK? ok ok, what will i get? how much? and where? In the states, not here yet. When the box does come out here it will be 3 boxes - 6/8/8 dvd count at about $120 each. 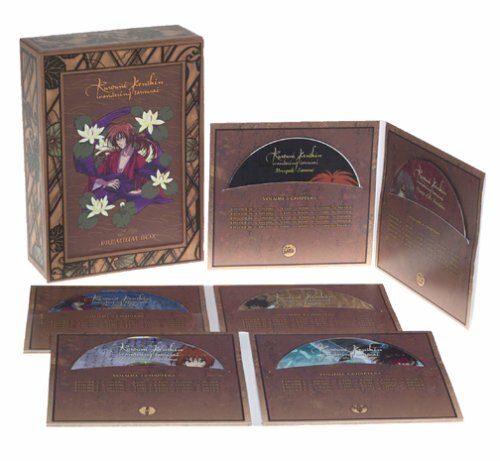 Even though I have the entire series it seems I may buy the boxsets including the DVD's once again. If you check Videouniverse.com you'll see that the english track is 5.1 Dolby Digital. Don't know if its true, I've asked Videouniverse.com and Rightstuf.com and none gave technical info (were unsure). In the end only the fittest survive in this world. But fighting him makes me somewhat...irritated. For them to remaster 95 eps with 5.1 in this short amount of time is also nearly not possible.